We all know the drill. Like a faithful retriever, our post is delivered once a day by a jolly (or not so jolly, depending on where you live) man in a truck. We receive our post, they move on with their rounds, everyone is happy. Imagine, then, that instead of the familiar face that you are used to seeing every day, you are met with the menacing stare of a robot, angrily approaching your doorstep. What do you do? Receive your post but risk certain death? Forgo your important letters in the hope of a better life? Luckily, it’s a choice we will never have to make. Phew. But in Postman Pat The Movie the dilemma is a very real problem. 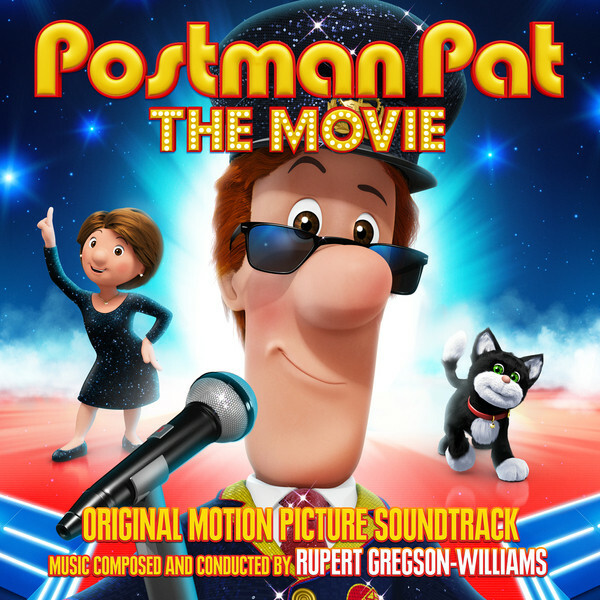 Adapted from the popular British television programme, Postman Pat The Movie sees the small town setting of Greendale made big, with brighter, louder and scarier narrative events than Pat and his cat have ever seen. Moving away from the traditional stop motion of the TV series in favour of computer animation, the movie sees Pat trying to make it big as he enters a talent competition. Chaos soon ensues, in the form of the evil Pat-bots and it is up to our favourite postman to, yet again, save the day. Gone is the Postman Pat singalong song, so indicative of the quaint television series. Scoring the film, Rupert Gregson-Williams manipulates and adapts familiar musical themes, expanding the franchise’s melodic potential. Whilst Gregson-Williams admits that he used the well-loved TV theme as a starter for his cinematic task, there are only the bare bones left of the original within the newer, bigger score. Transposing the sung tune to an orchestra, Gregson-Williams explained how he “built it up taking us through to a more broad and orchestral theme by the time we met our heroes, Pat and Jess”. Although there are certainly sniffs here and there of the small original, it is very clear that Gregson-Williams is scoring for the big screen and has therefore elevated his music accordingly. Gregson-Williams knows his audience. Moving the well-loved brand to the bigger screen and a bigger orchestra, he utilises the instruments cleverly in order to create a more local sound. Whilst many of the themes use traditional cinematic sweeping strings, they are counterbalanced with tripping pizzicato and staccato woodwind themes. The romanticism with which he imbues the music is constantly undercut by a sense of humour. The cue ‘Hotels’, for example, shifts between moments of lush tranquility and neat comedy. Splitting the number in two, Gregson-Williams uses both elongated musical motifs to ground the cue in its idyllic environment and skittering rhythmical melodies to undercut grandeur. The sound is balanced perfectly between a sense of overwhelming harmony and ever so slightly clumsy comedy. ‘Pat-Bot 3000’ hints for the first time at something a little darker. Using pared down musical motifs, constructed mostly from isolated rhythms, Gregson-Williams enables a number of contrasting themes to be squeezed into the same piece. Reaching its climax with a set of dizzying ascending string motifs, the cue is slightly offbeat, unsure and somewhat sinister. Placing a brooding string chord here and there, Gregson-Williams merely hints at something darker to come later. And, as is true of a number of the cues, the piece ends abruptly, introducing a brand new theme and cutting it short just as it begins to move somewhere. This is not to the detriment of the overall sound, however. The unannounced ending of the cues is refreshingly brash; Gregson-Williams only gives us as much as he has to. The music, inevitably, ventures into dramatics from time to time. Pushing the narrative very much into cinematic territory, Gregson-Williams uses high-speed motifs in cue ‘Scooter Chase’, pushing the music to its very limits. Whilst the balance of strings versus brass is certainly something that has been done before, Gregson-Williams’ contribution fits in nicely. He isn’t beyond more sinister scoring, either. In cue ‘Megalomaniac’ we are introduced for the first time to a full on villainous sound. Based largely in the rich depths of the brass section, the cue piles on the dramatics. True to form, however, Gregson-Williams cannot help pacifying the piece with a gentle interlude. Whilst the balance of woodwind and strings is beautifully achieved, it might have been nice to hear Gregson-Williams layer on the evil with more gusto. Overwhelmingly, Gregson-Williams’ music is a delight to listen to. Whilst he lays on the poignant strings a little too thickly from time to time, there’s no denying that the music is affecting. Moving the small town Pat to the big screen, Gregson-Williams’s music makes it hard to consider that we will ever be able to go back to the clunky theme song of the original TV series. Balancing dramatics, humour and heartfelt warmth, Gregson-Williams’ score is a true treasure and should be enjoyed by children and parents alike.